second battery to run on and the remote control female jack had ice init so I couldn't plug in the controlswitch to make the rear winch work. The front winch cable was too short and only powered by the smallbattery in the machine. I first went home and got a 15000 lb tow cable and hooked it up to the front winch to a big tree. 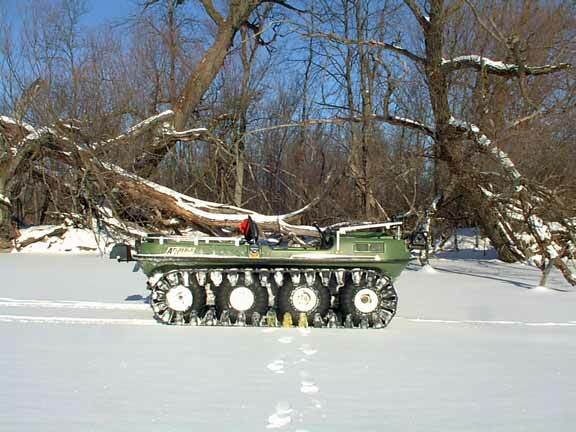 The front of the machine was lower in the water than the rear because of the engineso when I started winching the front of the boy came over the top of the ice but the tracks weretrapped under the ice ... the winch drained the battery and the Argo would no longer start. grip the ice and help not to mention getting it back to the house. and now I had to figure out which way the connector went together .. my frozen hands didn't help much. I went to the front of the machine and had my friend slide the heavy battery to me ... I had to lay across the front of the machine to try and pick it up but lost my grip and it went through the ice and into the river. believe my predicament and my bad luck. It was snowing, cold and my friend didn't trust the ice he was standing on. I sprayed the switches with the still warm WD40 and the controller started working!! with the connector and sprayed the control again and finally it started working. that made the errors through lack of experience. The rear winch was the thing that saved the machine and no-one I have spoken to has heard of an Argo with a rear winch! !